Jigokudani Snow Monkey Park, Yamanouchi Town, Nagano Prefecture. In recent years the 'snow monkeys' of Jigokudani have become world famous with people from all corners of the globe arriving in Yamanouchi to see them close up, playing and relaxing in the onsen hot springs. How far are the monkeys from...? Wild monkeys can sometimes be seen around many snow regions of Honshu. Sometimes you might be lucky enough to be driving along and see some walking by the side of the road. Those monkeys are somewhat wilder than the monkeys found at Jigokudani, where you are almost guaranteed sightings.... the Jigokudani monkeys seem to enjoy the onsen hot springs and also the food that is provided! The monkey park is located in Yamanouchi town, at the base of the Shiga Kogen ski and snowboard region. They are now so popular with foreign visitors that day trips to the park are available from popular ski and snowboard resort areas like Hakuba, Myoko, Nozawa Onsen and further afield. It is probably worth asking your accommodation if they have any specific tour recommendation. It's recommended that you have at least two hours. Don't forget to take your camera! From Tokyo Station, take the Hokuriku Shinkansen to Nagano Station. From Nagano Station, take the Nagano-sen (Nagaden) train to Yudanaka Station. From Yudanaka Station, take a bus or taxi to Kanbayashi Onsen. From there, it's about a 30 minute walk to the Jigokudani Yaen-koen entrance. Exit the Joshinentsu Expressway at the Shinshu Nakano IC. Before starting the climb up to the Shiga Kogen resort areas, you will see a sign on the left for Kanbayashi Onsen and the monkey park. Park your car and then walk to the Jigokudani Yaen-koen entrance (about 30 minutes). How far is the Snow Monkey Park from...? There is only one way to get to the Shiga Kogen resorts during the winter season - via Route 292 from central Yamanouchi. 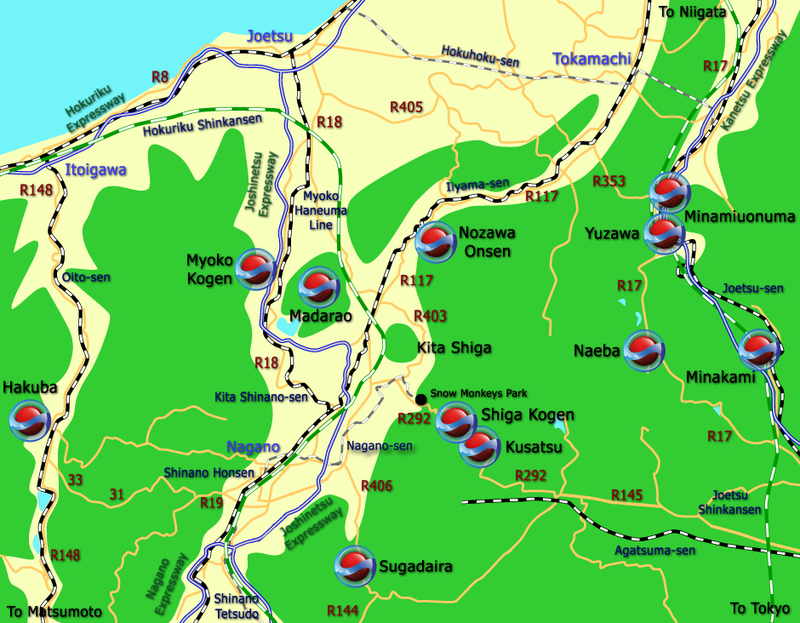 So please refer to the Shiga Kogen Travel Guides (by train : by car) for more specific travel information on how to get there. The Jigokudani Monkey Park is located about 10km before the nearest of the Shiga Kogen resorts.